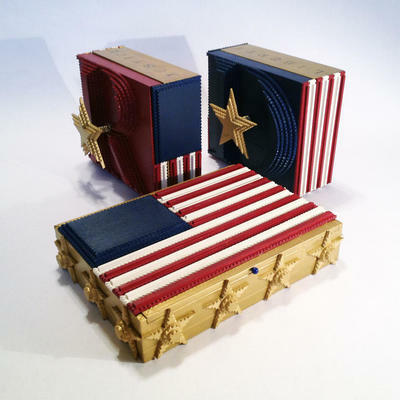 The Art Tramp Ballot Box Trio – "Liberty" "Justice" "For All"
This Patriotic Trio is made from cigar boxes. "LIBERTY" features the capital letter "D" on a field of blue with a gold star floating above. Inside you will find a vintage Schoenhut toy Donkey and an "American Family" tradecard. "JUSTICE" features the capital letter "R" on a field of red with a gold star floating above. Inside you will find a vintage Schoenhut toy Elephant and an "American Family" tradecard. And the final piece in the trio, "FOR ALL" features the American Flag with gold stars wrapping around the sides. A vintage Dresden Gold Eagle on top of a pleated crepe paper disk has been placed on the interior lid. Together these "Ballot Boxes" symbolize the fundamental values we have learned since childhood. As we memorized and recited the Pledge of Allegiance..."I pledge allegiance to the flag...with Liberty and Justice For All". Approximately 176 hand-cut and carved pieces of wood were used in creating this one-of-a-kind work of art.